"Texas fever is also commonly known as Spanish fever, Splenetic, or Murraine fever. It is a specific fever communicated by cattle which have recently been moved northward from the infected district, or which is contracted by cattle taken into the infected district from other parts of the world. Texas Fever is caused by an organism which lives within a red-blood corpuscle and breaks them up. It is therefore simply a blood disease. The organism does not belong to the bacteria, but to the protozoa. It is not a microscopic plant, but it belongs to the lowest forms of the animal kingdom. This is a very minute organism that multiplies very rapidly in the body of the infected animal, and in acute cases causes an enormous destruction of red corpuscles in a few days. How in gets into the red corpuscle cannot be explained, but it appears that it enters as an exceedingly minute body, probably endowed with motion, and only after it has succeeded in entering the corpuscle does it begin to enlarge. It is accompanied by high fever, greatly enlarged spleen, destruction of the red blood corpuscles, escape of the colored matter of the blood through the kidneys, giving the urine a deep red color, by a yellowness of the mucous membranes and fat, which is seen more especially in fat cattle, by a rapid loss of strength, and by fatal results in a large proportion of cases. Signs of Texas fever are the animal standing perfectly still in the position that they take to hold back, head down, fore feet thrust slightly forward, ears drooped down and the animals are neither hungry nor thirsty. It seems their bowels become very impacted, in fact it seems as if their intestines become entirely dry, and unless an operation can be done they die. Another symptom that appears several days before the actual sickness, is a dry cough. In a few days the nose becomes dry, at this stage the breath will be found to have lost its sweetness, so peculiar to grazing cattle, and assumed the sickening, feverish smell, found in Texas cattle. This new odor can be best described by comparing it to the smell of our slaughter houses, or constantly crowded stock yards and cities. From this condition, in one or two days the fever gains its highest stage, and is found to have disseminated itself over the whole body, the heat being very great, and the arteries in the neck seem to be in short, heavy throbs; the animal getting up and lying down with difficulty. The animal has difficulty breathing; the end of the tail is usually hollow for two or three inches; the pith in the horns starts to decay; the animal refuses to notice the herd, remaining stupid, and refuses to seek food or water. Some, in this stage, will pass water mixed with blood and dung naturally; others will pass water of a natural color, and no dung, or may pass very little that appears as a dryish lump. In another type of the disease, which will occur perhaps every eight or tenth case, after being taken the same way and having the same symptoms as those described; however, the animal does not get weak, sluggish or stupid, but is always standing and shows a watchful attitude, rushing toward any sound heard, even through obstacles. Animals eyes are very glaring, wild and have a green cast, different from those of the first type which show a dead, sleepy, and glazed appearance. Both of these cases cause death without any change except that their hair dies and they gain an appearance of a dry hide." Remember that the information above represents the best knowledge available in 1912. Many discoveries about the disease, the tick, its prevention and its treatment were yet to be made. The earliest accounts we have of this disease date back to 1814, the cattle from a certain district in South Carolina were found to pass on the disease to any other cattle they came in contact with while in progress to the North. 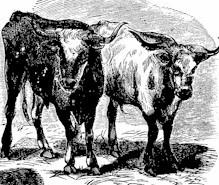 These cattle were prohibited from the state of Virginia to pass through in fear of killing off entire herds. These cattle infect others while they themselves are in perfect health, on the other hand cattle from Europe are attacked by the disease which generally proves fatal. However, the most frequent and severe losses followed the driving of cattle from the infected district in Texas into and across the western states and territories, which led to the disease being named Texas Fever. It is also known that the infection had been also found in southern Europe, Central and South America, Australia, South Africa, and the West Indies. This disease was believed to be passed by cattle being moved during the cattle drives. As the Texas cattle were being driven they would occasionally stop and graze and then move on. The native cattle were afflicted with the disease whenever they grazed the same land, nine-tenth of all cattle afflicted with this disease died. This page was designed by Jason Phillips and Doug Pascoe.